In the last week of November and the first week of December I had my holiday, which I choose to spend in South East Asia. The first stop was Singapore, where I have some family . That made it an exellent point to start my trip. The flight to Singapore is quite long from where I'm living and the 7 hour time difference is not very nice either. The moment I stepped out of the airport and into the taxi the rain started pouring down, topped off with a nice loud lightning strike - that was an excellent start. Singapore is a very modern and western city, albeit it has a lot of eastern influences. Not only from the Chinese and Malay , but also from Tamils. Therefore in Singapore most signs are in 4 languages (English, which is still the primairy language, Mandarin Chinese, Tamil and Malay). The influences from the other cultures are mostly visible in dedicated areas. There is Little India and of course China Town. 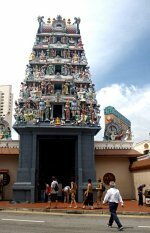 Interestingly enough, the largest hindoe temple (to the right) is in China Town :). When Stamford Raffles reached Singapore in the early 1800s he did not find a large bustling city that is now Singpare, but instead he found a lot of rain forest. 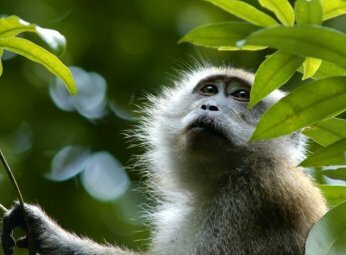 There is still some of it left, in the northern part of the country, in a nature reserve called Bukit Timah where monkeys still roam freely (although they also pester you near the entrance of the park). From Singapore we made a 6 day trip to Bangkok , which official name in Thai is "กรุงเทพมหานคร อมรรัตนโกสินทร์ มหินทรายุธยามหาดิลก ภพนพรัตน์ ราชธานีบุรีรมย์ อุดมราชนิเวศน์ มหาสถาน อมรพิมาน อวตารสถิต สักกะทัตติยะ วิษณุกรรมประสิทธิ์". Bangkok is a whole different world compared to Singapore. Where Singapore is clean and modern, Bangkok is large and polluted and has a horrible traffic problem. The main attraction (atleast for me) is all the different temples (wat in Thai). As I like photography, all those temples are a nice subject to take shots of. At your left you find the 46 meter long reclining buddha at Wat Pho . Above is one of the decorations around the building housing the emerald buddha at Wat Phra Kaew . This temple lies on the Grand Palace premises, which houses a lot of other templates and the some buildings used for royalty. We visited the day before the King's birthday which unfortunately meant that some of the buildings were closed. Our hotel was close to Khaosan Road , which is a very vibrant area with lots of food stands and shops that sell fake stuff :). 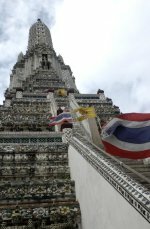 One temple that has quite a different style compared to the others is Wat Arun which you see here on the left. It's in Khmer style and covered with porcelain. After 6 days we left Bangkok and prepared for our next trip. The next trip went to Bintan, an Indonesian island about an hour by ferry from Singapore. As Dutchie I needed to get a visa for Indonesia so we had to spend some annoying time at the Indonesian embassy in Singapore. We managed to retrieve our passport with the visa just in time before going to Thailand so we were all set to go. 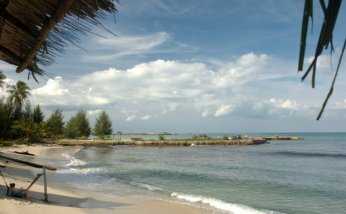 Bintan is a small island and mostly leased by Singapore to put resorts on. We did not go to the North Western resort area but instead we went to Trikora Beach on the east side. We stayed at the Shady Shack which is definitely not a luxurious place. It did have running water (from a large tank) and electricity but that was about it. The main attraction was the nice beach on which our shacks were located. We were the only tourists there and it was very nice and quiet to relax on for a whole day. On the second day of our stay we walked to a nearby fishing village that was built on poles in the ocean. During the night the villagers go out fishing with their kelang (houses on floats) and during they day they would sell their fish in the village. Bintan gave me a small tan and I relaxed quite nicely. In the afternoon of the second day we went back to Singapore where I concluded my holiday. For all the other pictures that I made during the trip see my gallery .